If you can, try to find blanched (already peeled/hulled) hazelnuts. If anyone knows a good, dependable domestic (North American) source, I’m all ears. Roasting them really makes a wonderful difference, too. Each bar is very filling! Great for pre- or post-exercise, or for traveling or a long commute; I wrap them in wax paper or parchment, then pop them in a zippy bag. I keep the bars refrigerated for longer term storage. They’re yummy either cool and firm, or room temperature and soft. Roast the hazelnuts in a 350ºF degree oven, stirring once or twice, until golden brown — about 10 to 15 minutes, depending on your oven. Allow to cool to room temperature. Line a square pan, either 7×7 or 8×8 inches, with parchment or wax paper. 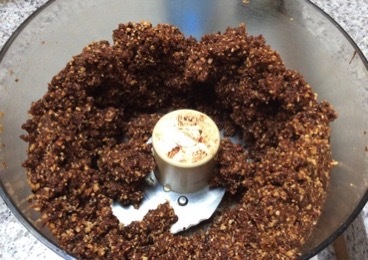 Roughly chop hazelnuts in a food processor. Add the dates and salt, and pulse in 10 to 30 second intervals until finely ground (see photo below), adding the chocolate midway. Inevitably, the mixture will become somewhat oily, but try to avoid making it a complete paste that’s very oily. Having the nuts at room temp or cooler somewhat reduces to oiliness. 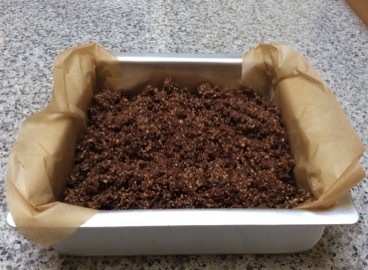 Place the mixture into the lined pan, and firmly press it in with a paper towel. I usually go through 2 to 4 sheets of paper towels to help remove excess oil. Chill in the fridge until firm, at least a couple hours or more. 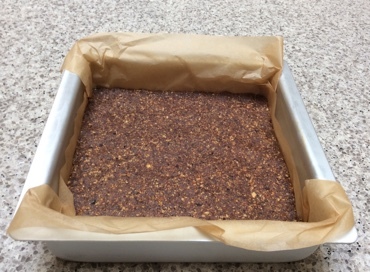 Remove the mega-bar from pan and onto a chopping board. If needed, pat away more oil with paper towels. 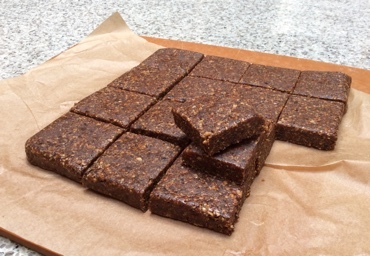 Slice into 16 equal-sized bars (or 24 bars, if you prefer them on the smaller side). Store in the fridge until ready for consumption. This is what the ground mixture of all ingredients should look like at the end of step 4. Step 5, dump it into the pan! After some amount of pressing with several paper towels, and firming up in the fridge, after step 6. This was written by sairuh. Posted on Tuesday, July 21, 2015, at 5:21 pm. Filed under Food. Tagged cherries, chocolate, hazelnuts, recipe, snacks. Bookmark the permalink. Follow comments here with the RSS feed. Post a comment or leave a trackback.